IF YOU WOULD LIKE TO BID ON THE ARIZONA STATEWIDE AUCTION TAG FOR DESERT BIGHORN OR ROCKY MOUNTAIN BIGHORN PLEASE LET US KNOW. I had a great hunt with archery hunter Travis Wuest of Texas. Region III unfortunately has suffered a major die off due to pneumonia and 15D has seen the sheep numbers drop over 60% so far with more death loss to be expected over time. Travis harvested a 10 year old ram with his bow on the 4th afternoon of the hunt. He was very fortunate to get a Class IV ram even though none were surveyed from the air during the aerial helicopter surveys. What a great hunt with archery hunter David Brow who harvested a 9 year old ram that gross scored 181 0/8 and 179 1/8 Net with his bow and arrow. We had an awesome hunt with Mr. Bob O'Connor from Payson, AZ on his Unit 15D Desert Bighorn Sheep Hunt. Darr Colburn found a great ram in his scouting and Bob harvested it. It has a 39 1/8 long horn and 38 4/8 on the other with 15 inch bases. We are still waiting the official score but the unofficial green score is 175 4/8. Click here to see more of Bob's great hunt. We had an incredible hunt with 12 year old Averi Elms from Baker City, Oregon. Averi harvested a class IV Ram that was aged by the AZGFD at 9 years old. Her ram scored 164 3/8 NET at AZGFD checkout. Averi was joined on her hunt by her father and grandfather who both are sheep nuts. Averi started her hunt when she got out of school for Christmas break on the 19th of December and finished just in time to make it home for Christmas morning! Click here to see more on Averi's hunt. We were privileged to guide Mr. Claude Warren from Saco, Maine on his 2013-14 raffle sheep tag. He harvested a 9.5 year old ram with 16 inch bases and a 40 inch long horn. The ram officially scores 181 1/8 NET and 185 3/8 Gross which makes it the largest Nelsoni ram ever harvested in the state of Arizona. This is the largest ram to ever come out of Unit 15D. Click here to see more on Claude's awesome hunt. We were excited to guide Terry Lancaster from Wisconsin, on his Unit 15D 1st hunt. Terry harvested a sweet Nelsoni ram with a 37" horn on his left side. The AZGFD checkout score was 165 4/8. Terry was an absolute dream to hunt with. Click here to see photos and videos of Terry's great hunt. I was fortunate to join friend, Brian Rimsza, on his personal tag for Rocky Mtn Bighorn Sheep in Unit 6A. Brian had the second hunt and harvested our #3 ram with his Elite bow. Our #1 and #2 ram were both harvested on the first hunt. Brian's ram ties the AZ Archery state record at 176 4/8 Net and 178 1/8 gross. I helped him on this hunt as a friend not as his guide. Congrats to Brian on a fantastic ram! Click here to see more photos and video of Brian's hunt. Colburn and Scott Outfitters was fortunate to guide Mr. Larry Spillers from Ennis, Texas on his 2012-13 AZ Super Raffle Sheep tag. Larry harvested a 9.5 year old ram with 15 inch bases and 9 4/8 inch 3rd quarters. We saw over 100 rams. Larry's Unit 15D ram is the fourth largest to be harvested on this Raffle Tag. Click here to the view pics and video of Larry's hunt. For the general season in 2012, we were hunting with our friend Ernie Meeske, of Payson, AZ, who had drawn arguably the best desert sheep tag in the state of Arizona, Unit 22. We had 17 days of scouting put in to this hunt during the months of October and November. We found, filmed and videoed many fantastic rams and some would score over the magical 180 inch mark. Ernie harvested the largest ram in the state of Arizona in 2012 including the 2012 auction ram. Ernie's ram was checked in at the AZGFD department at a whopping 186 7/8 inches. The ram has 16 4/8 inch bases and over 38 inch horns. Congrats to Ernie and his son Seth Meeske on the harvest of such a fine trophy. SCORE UPDATE: Official NET score 186 1/8. Click Here for more pics and video of this hunt. Jay Scott (R) with Ernie Meeske and his giant Arizona Desert Unit 22 ram. Net Score 186 1/8. Colburn and Scott Outfitters had the privilege of guiding Mr. Donnie Young on the Arizona Super Big Game Raffle Desert sheep Tag. This sheep tag is only valid in AZ sheep units 9/10, 12, 13, 15A, 15B, 15C, 15D, 16's. The sheep in these units are the Nelsoni species. Donnie harvested a 9 year old ram that is the biggest desert ram harvested on this raffle tag since 1995. We scouted and hunted 25 days and saw over 115 rams. Guides Darr and Jay had so much fun scouting for this hunt. We were able to take photos and videos of most all of the rams that we encountered. Here is what Donnie had to say about his AZ raffle sheep hunt, "My lifelong dream of a great desert ram had come true. The ram scored 166 7/8. My desert bighorn sheep is the largest Nelsoni ram taken with the AZ Super Raffle tag since 1995. Darr Colburn and Jay Scott made it happen! They worked there tails off to insure that I had a great hunt and experience!" Jay and Darr with Donnie Young and his 2011-2012 Arizona Super Big Game Raffle Desert Sheep. This is the 2nd largest ram harvested on this Raffle tag in 18 years. we were in Arizona Unit 44B South with friend Erik Swanson. Erik harvested a ram we nicknamed "Pinky". His ram official net Boone and Crockett score is 168 5/8 net. We have some great photos and video of Erik's book ram. Here is what Erik had to say about his hunt, " When you finally get the opportunity to hunt for a once-in-a-lifetime Arizona desert bighorn, bringing the best resources to bear is paramount. Having my friend Jay Scott along as a member of the hunt team was exceedingly helpful. I don’t know anyone that is more thorough with research or better utilizes all the available tools to influence the controllable aspects of a hunt. His assistance during the information development phase in particular was tremendously beneficial. 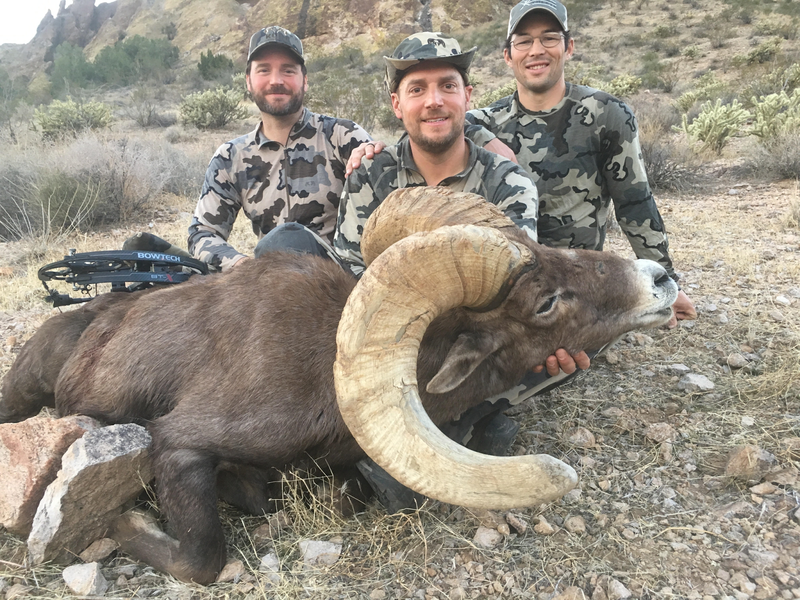 In addition, I was able to leverage Jay's field judging methodologies and previous desert sheep hunting experience, thus ensuring I harvested the biggest ram in the unit.-Erik Swanson"
This hunt was a much anticipated hunt for the Colburn and Scott Outfitters team. Ron Arndorfer, from Wisconsin, had drawn a tag in Unit 44B North. Darr and I put in a bunch of time scouting throughout the summer and fall and saw lots of nice rams. We focused on one particular ram that we had seen in the 2009 season with Glenn Hall who had a tag in the same unit. He was nicknamed "LOGO Ram" by Glenn Hall's son Tyler. Ron was able to complete his Grand Slam by harvesting the LOGO ram. We were honored to be Ron's guides on this hunt. Ron's ram officially net scored 170 3/8 inches. Glenn Hall harvested a whopper ram in the 44B North with the help of Jay Scott. Glenn's ram officially netted 176 4/8 inches! Glenn shot this ram with a muzzleloader and is the #3 ram in the Longhunter record book. We had a fantastic hunt! Glenn talks about his hunt, "It was great to have Jay's help on my hunt! His glassing skills and good attitude made a difference on my hunt of a lifetime."